Indra was known in early Indo-Iranian religion. Whether Indra is cognate with other Indo-European thunder-gods such as Thor, Tarhun and Taranis is highly speculative; it is generally considered that the Indo-European root for the name cannot be reconstructed. However, in the Vedic religion Indra has prominence over the chief god of the Indo-European pantheon Dyēus (Dyēus appears in the Vedas as Dyaus Pita, a relatively minor deity who, interestingly, is the father of Indra). Indra was the Supreme Deity, God of war and a natural phenomenon personified for the Indo-Aryans. The battle between Indra and Vritra is depicted in ancient Iranian religions such as Zoroastrianism. Indra is an important god in many tales and epics. He leads the Devas (the gods who form and maintain Heaven and the elements, such as Agni (Fire), Varuna (Water) and Surya (Sun)), and constantly wages war against the demonic Asuras of the netherworlds, or Patala, who oppose morality and dharma. He thus fights in the timeless battle between good and evil. In addition, he is one of the Ashta-Dikpalas, representing the east. Some scholars think that originally Indra was probably a solar deity, riding a gold chariot across the sky. He brought water to Earth, and as such is sometimes worshipped as a god of fertility who can also resurrect soldiers who die in battle. In art, Indra is depicted as a muscular, red man, sometimes with four very long arms. Indra’s weapon, which he used to kill Vritra, (with the help of other gods), is the thunderbolt (Vajra), though he also uses a bow, a net and a hook. He rides a large, four-tusked albino elephant called Airavata. When portrayed having four arms, he has lances in two of his hands which resemble elephant goads. When he is shown to have two, he holds the Vajra and a bow (Masson-Oursel and Morin, 326). Indra lives in Svarga in the clouds around Mt. Meru. Deceased warriors go to his hall after death, where they live without sadness, pain or fear. They watch the Apsaras and the Gandharvas dance, and play games. The gods of the elements, celestial sages, great kings and warriors enrich his court. He is married to Indrani (whose father, Puloman, Indra killed), and is the father of Arjuna (by Kunti), Jayanta, Midhusa, Nilambara, Rbhus, Rsabha. Indra is also the father of Vali and Surya. He is attended to by the Maruts (and the Vasus), children of Diti and Rudra. Indra had murdered Diti’s previous children, so she hoped her son would be more powerful than him and kept herself pregnant for a century, practicing magic to aid her fetal son. When Indra discovered this, he threw a thunderbolt at her and shattered the fetus into 7 or 49 parts; each part regenerated into a complete individual, and the parts grew into the Maruts, a group of storm gods, who are less powerful than Indra. According to one belief, Indra pulled his father, Dyaus Pita, from the sky by the foot; he fell to his death; afterwards, Indra married his mother Prthivi, who supported the murder. Indra is not a perfect being, and is ascribed with more human characteristics and vices than any other Vedic deity. Perhaps consequently, he also has the most hymns dedicated to him: 250 (Masson-Oursel and Morin, 326). A well-known story about Indra tells of a sin that he committed and how he was punished for it. Indra had an affair with Ahalya, wife of Gautama Rishi. He was punished by Gautama with a curse that one thousand female organs would cover his body in a grotesque and vulgar display, and that his reign as king of gods would meet with disaster and catastrophe. Gautama later commuted the curse, upon the pleading of Bramha, to one thousand eyes, instead of female organs. Due to this sin Indra’s throne remains insecure forever. He is repeatedly humiliated by demonic kings like Ravana of Lanka, whose son Indrajit (whose name means victor over Indra) bound Indra in serpent nooses and dragged him across Lanka in a humiliating display. 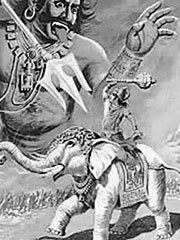 Ravana released Indra when Brahma convinced him to do so, but Indra, as the defeated, had to pay tribute and accept Ravana’s supremacy. Indra realized the consequences of his sin, and was later avenged by the Avatara of Vishnu, Rama, who slew Ravana to deliver the three worlds from evil, as described in the epic Ramayana. Vritra, an asura, stole all the water in the world and Indra drank much Soma to prepare himself for the battle with the huge serpent. He passed through Vritra’s ninety-nine fortresses, slew the monster and brought water back to Earth. In a later version of the story, Vritra was created by Tvashtri to get revenge for Indra’s murder of his son, Trisiras, a pious Brahmin whose increase of power worried Indra. Vritra won the battle and swallowed Indra, but the other gods forced him to vomit Indra out. The battle continued and Indra fled. Vishnu and the rishis brokered a truce, and Indra swore he would not attack Vritra with anything made of metal, wood or stone, nor anything that was dry or wet, or during the day or the night. Indra used the foam from the waves of the ocean to kill him at twilight. In yet another version, recounted in the Mahabharata, Vritra was a Brahmin who got hold of supernatural powers, went rogue and became a danger to the gods. Indra had to intervene, and slew him after a hard fight. A horrible goddess named Brāhmanahatya (personified sin of brahmin murder) came from the dead corpse of Vritra and pursued Indra, who hid inside a lotus flower. Indra went to Brahma and begged forgiveness for having killed a Brahmin. «Vajrayudha» which Indra possessed is believed to be prepared from backbone of a sage Dadhichi to kill Asuras. In Buddhism, Indra is purported to have given the Buddha courage in undertaking the difficult task of teaching humanity the path to nirvana/liberation. In Jainism, Indra awards a golden robe to Mahavira, and later welcomes him into heaven. 1. Masson-Oursel, P.; Morin, Louise (1976). «Indian Mythology.» In New Larousse Encyclopedia of Mythology, pp. 325-359. New York: The Hamlyn Pulishing Group. Indra is also a given name for girls in Italy, Germany and other countries. Male Deities: Brahma | Vishnu | Shiva | Rama | Krishna | Ganesha | Indra | Lakshman | Hanuman | Surya | more.. Female Deities: Gayatri | Lakshmi | Saraswati | Durga | Devi | Sita | Radha | Kali | Parvati | Shakti | more..